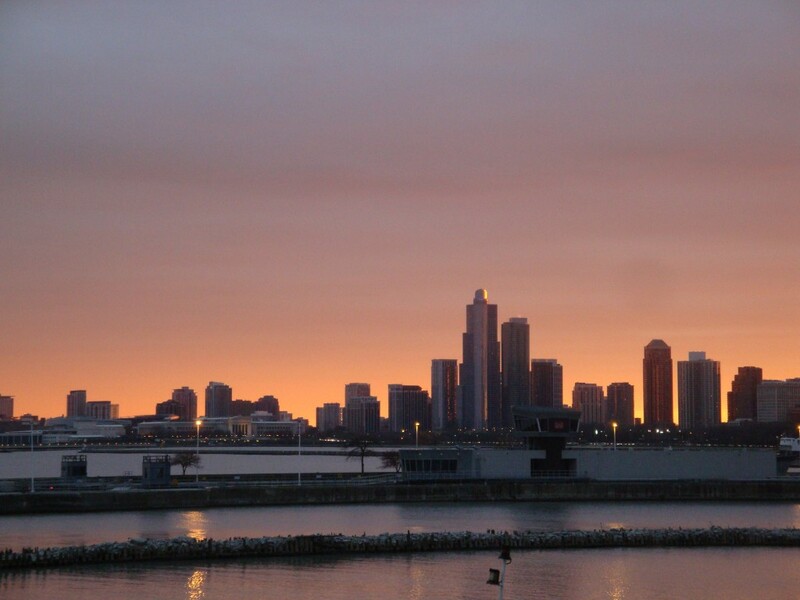 A beautiful sunset backlights downtown Chicago, taken from Navy Pier. Welcome to part two of my photojournalistic quest to document and share the incredible happenstance that was the Hot Glass Roadshow at SOFA Chicago. Having our glassblowing stage set up for demonstrations at this expo was a wonderful opportunity for people to view glass artists actually creating their work; instead of just seeing the end result all throughout the room and wondering how it was made. 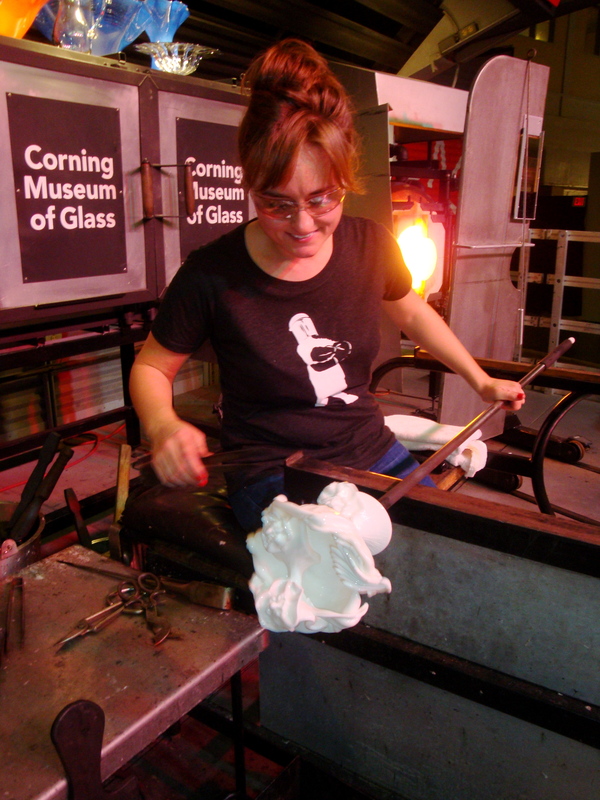 Being able to view the process in situ was a unique chance to gain a new or better appreciation for the work and skill that went into crafting the glass creations exhibited at this annual gala event. One last glimpse of a large feathered vase being made by George Kennard, CMOG gaffer. One of our demonstrating artists that I was happy to reconnect with was John Miller, a well known glass sculptor who heads up the glass department at Illinois State University. The last time I worked with this larger-than-life-living gent was last December on the Celebrity Cruise’s ship the Solstice where John was a visiting artist on our Hot Glass Show stage. John Miller attaching some chopped up cane sprinkles to his giant hot glass donut. 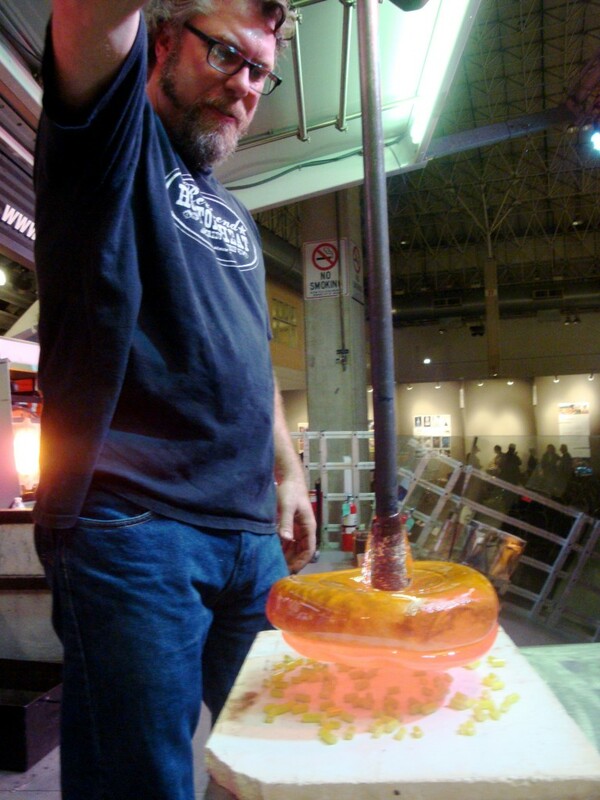 One of the benefits of seeing John make one of his signature giant solid glass donuts was that after his demo you could go see and marvel over a wonderful display of his work while he was there to meet and talk to. 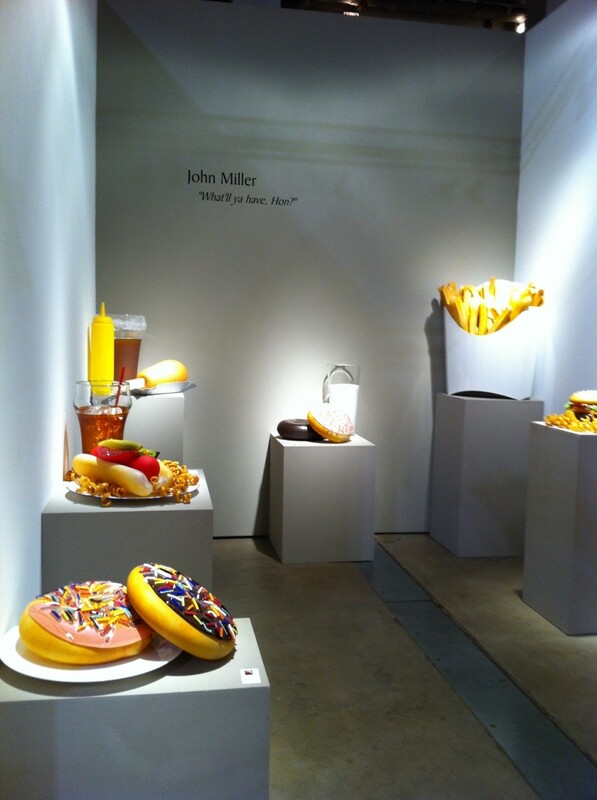 John Miller's super sized Americana diner food exhibit at SOFA. Every glassblower who works in a new studio is always prepared to adjust to using different tools or equipment that might be set at different temperatures. It’s comparable to a chef cooking in someone else’s kitchen. 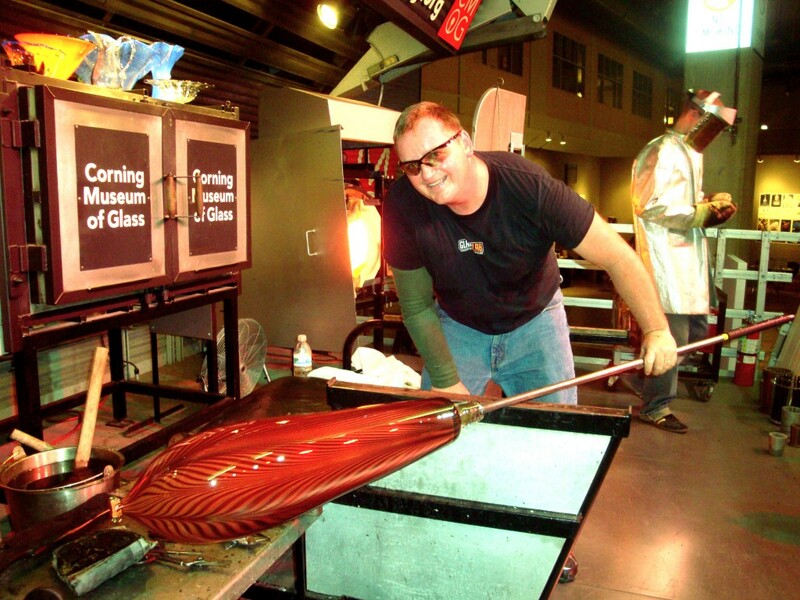 Several of the artists who came onto the Roadshow stage were challenged by their choosing to create a piece that was similar to their work displayed at their booths because they were accustomed to using torches; which enabled them to control the temperature of the glass at specific points. I was impressed when Nadine Saylor successfully put together one of her signature elegant teapot forms without the use of a single torch. Nadine Saylor putting the final touches on her 3 part teapot. The handle and spout were made separately and attached. I thought it made for a rather exciting demo as the handle was flopping around wildly prior to Nadine sticking it to the body of the teapot. We were all excited when it was successfully completed; a round of high fives was triumphantly exchanged amongst the glassblowers (Nadine, Steven, and I) on stage. 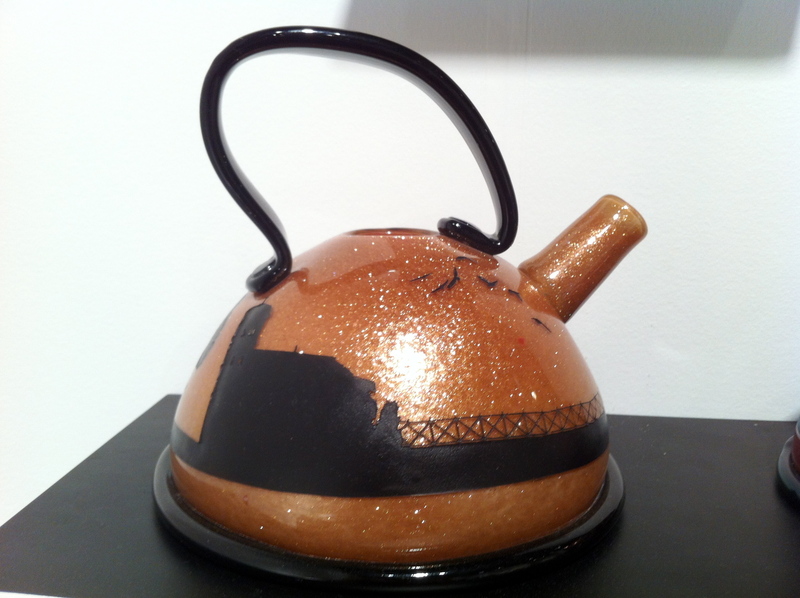 Nadine's gold adventurine teapot on display at Riley Gallery's booth. Prior to her demo, I had visited Nadine’s work on display. The domestic icon imagery of barns, windmills, and tractors that she had applied to her teapots and thimbles by sandblasting and painting the surfaces was evocative in many ways. Amber Cowan reconstructing pieces of vintage white pressed glass. Another of our demonstrators was Amber Cowan, whose manipulation of American pressed glass tableware into ethereal and forlorn creations couldn’t help but capture the viewer’s attention. She brought several thrift store found pieces of Colony Harvest pattern vintage milky white compotes, along with flowers, feathers and pearls that she had flameworked herself with solid white glass. Everything was put into a cold pick up oven and brought up to 1000 degrees; then attached together; tweezed and cut into its final nostalgic reincarnated form. 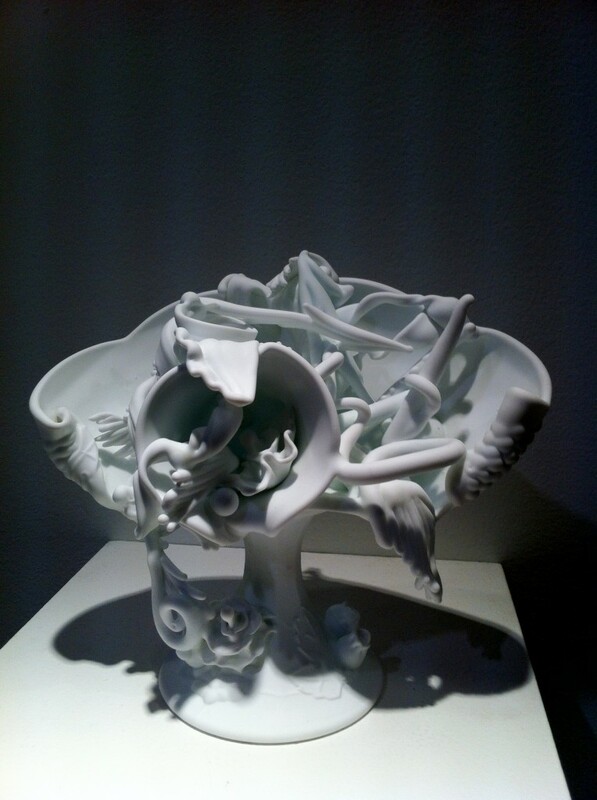 Amber Cowan's Wedding Compote shown at Heller Gallery, similar to the one made during her demo. All the amazing talent and joie de glass vivre on the Roadshow stage those three days was just the tip of the proverbial art and design iceberg of all the artists represented at SOFA this year. 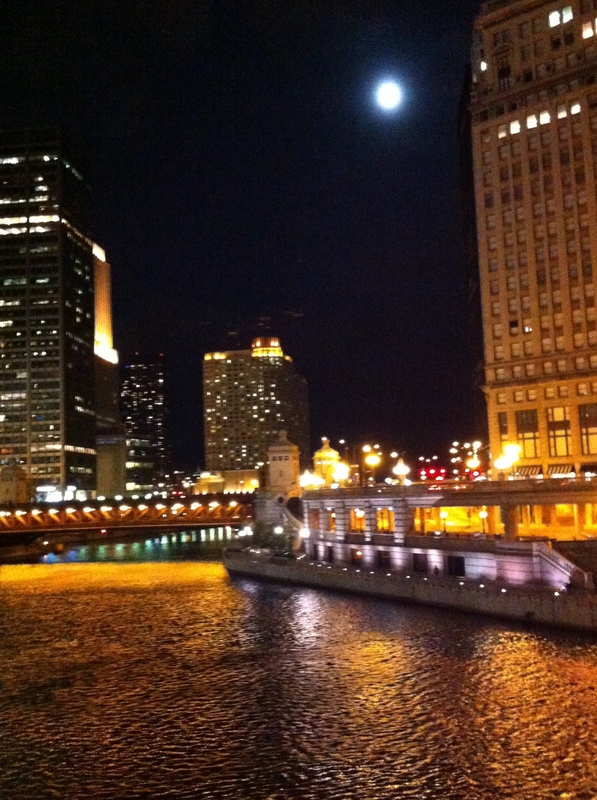 As a first time SOFA attendee I can safely say that all my expectations and preconceived notions of what to expect were pretty much blown out of Lake Michigan’s waters and I can’t wait for next year. Hope to see you there! 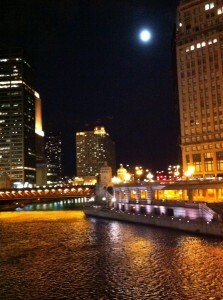 Full moon plus downtown Chicago equals splendid! 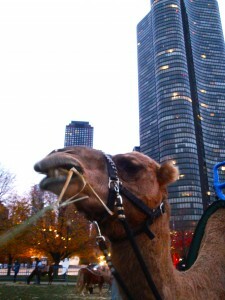 A camel and a skyscraper right in front of Navy Pier! Surreal much?